Rapala's MaxRap is a slender jerkbait that is designed to cast far and have a wild darting action when retrieved. It's Rapala's premium level jerkbait and they have included a lot of advance features and details that are more typical of a Japanese import that is twice the price. 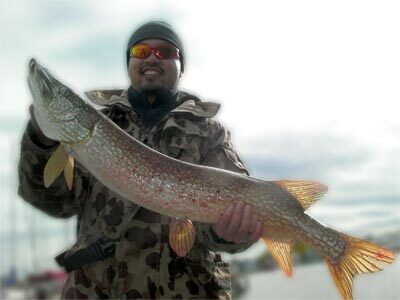 The MaxRap is durable enough that my clients caught many large pike like this one and the lure showed few signs of wear. These jerkbaits are very tough. They held up against many large pike. The aerodamic shape and weight shifting system are great additions that help improve casting. The VMC Spark Point hooks are sharp and durable. The MaxRap are available in some beautiful colors. The internal laser etched scales and 3D holographic eyes add a nice finishing touch to the lure and make it look very polished. My only complaint is that I would like to see more colors and patterns. It is one of those lures that should come in every shape, size and color. 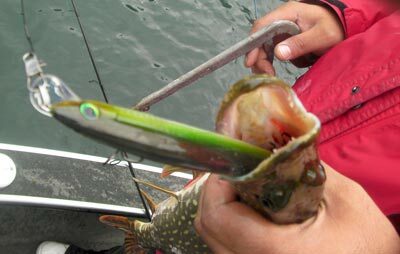 This pike's eyes were bigger than his stomach. The MaxRap casts a mile thanks to its extremely slender profile and MaxCast internal mechanism. MaxCast is a shifting weight system that really helps propel the lure when casted, but falls back in place when retrieving so that the lure remains balaced. We tested this lure in heavy wind and cast the bait directly into the wind. It knifed through the wind with ease. We used this lure on 30lb Suffix Gore on a 7' medium heavy spinning rod. Make sure you have enough line on your spool or else you may spool yourself on a cast! MXR 17 is a dream lure for shore fisherman - I can see this being an amazing bait for shore casting for walleye in the Bay of Quinte. I can't wait to try it this Fall. It has a slow seductive wobble on a straight retrieve, and this type of action is a killer in cold water! My clients and I caught pike on a straight, slow and steady retrieve as well as the traditional jerk-jerk-pause. We also caught fish dead sticking it. It was very easy to use and caught all kinds of pike in every size - even fish not much bigger than the lure were trying to swallow! There are a lot of jerkbaits on the market, and many that also include weight shifting systems to improve casting distance, so it's difficult to make a jerkbait that stands out against the rest. However, a lot of them in this price range aren't as durable as the MaxRap. The cost of this lure might be more than some of Rapala's other jerkbaits, but it is definitely worth the extra few bucks. The MaxRap is a beautifully designed jerkbait that has a wide wobble that is great for seducing pike and walleye. Its tough construction means that it will hold up well against these toothy fish, and will continue to look well for a long time. The MaxCast system and VMC Spark Point hooks add the finishing touches that make this lure well worth the price.